This recipe, which comes from the region of the Jura in the foothills of the Alps, is one of the marvels of French country cooking. In France it is often made with the famous blue-footed chickens from nearby Bresse. Vin jaune is a white wine from the Jura that undergoes extensive aging in oak barrels, giving it an oxidized flavor and a rich golden-yellow color. Its flavor resembles that of sherry. 1. If using fresh morels, cut in half then lean carefully with a soft brush. Reserve. If using dried morels, cover with warm water and leave overnight. 2. Peel and dice the onion. Peel and crush the garlic. Peel and dice the shallot. Cut the chicken in fricasse (8 pieces) and tie with kitchen twine. 3. Put the chicken pieces, onion, garlic and shallots in a bowl. Put the thyme sprigs on top. Marinate all with 7 oz of Vin Jaune. Reserve the remaining 1 oz of wine for finishing the sauce. Cover with plastic wrap and leave the chicken to marinate overnight. 4. The next day, strain the marinade off the chicken pieces and reserve. Separate the chicken pieces from the vegetables and pat the chicken dry with a paper towel. 5. If using fresh morels, saute them lightly in butter, season with salt and pepper and cool. If using dried morels, strain the soaking liquid through a fine mesh sieve and reserve. Gently squeeze the mushroom to remove all the liquid. Cut the mushrooms into bite sized pieces. Reserve. 6. Melt 4 tablespoons of butter in a Dutch oven or heavy pot. Roll the chicken pieces in flour, then tap off all excess. When the butter begins to turn pale golden, add the chicken pieces, lower the heat to medium-low and saute without color on all sides, about 6 minutes. 7. Remove the chicken from the pot to a plate. Wipe any extra fat from the pot, then add the 1 tablespoon butter, the marinate vegetables and the thyme. Sweat gently over low heat to soften a bit. Return the chicken to the pot. 8. Cover the pot and put it into a 300 degree oven. Cook 20 minutes. Add the wine from the marinade to the pan. If using dried morels, add the soaking water to the pan. Bring to a simmer, cover and return to the oven for about 10 minutes, or until the leg pieces are cooked through and tender. 9. Move the pot to low heat and remove the lid. Remove the chicken pieces and keep warm. Strain the cooking liquid and return to the pan, discarding the vegetables and thyme sprig. Add the cream and mushrooms to the pan, bring to a gentle simmer. Cook until the cream has reduced to a light sauce consistency. 10. Season the sauce with salt and ground white pepper. Add the reserved vin jaune and again simmer until the proper consistency. 11. Return the chicken pieces to the pan and heat through. Finish the sauce by working in 1 tablespoon of cold butter. Serve with boiled rice, pasta or spaetzle. 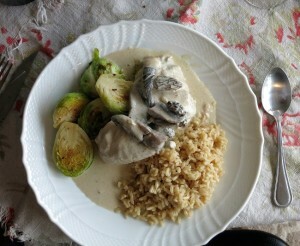 This entry was posted in Savory Dishes and tagged chicken, Mushrooms, poultry, Wine. Bookmark the permalink. wonderful, but what happened to post with all the photos of the process? Pour les morilles, on peut utilizer les champignons de Paris mais le gout n’est pas de tout le meme. Dan cette recette, c’est le rapport poulet/vin jaune/morille qui est vraiment super. Il faut dire aussi que, meme si les morilles sechees sont cher, ce recette demande tres peu (.5 oz = 14 grams). Pour le vin, pour 2 poulets (de 1.75 kg), il faut compter un bon demi litre de vin pour les deux. ” Cut the chicken in fricasse (8 pieces) and tie with kitchen twine.” seems a bit strange. Tie up the pieces to each other….? In a classic chicken fricassee, the pieces are individually trussed so that each piece cooks evenly and has a consistent shape. For info on what this looks like I would try Le Technique by Jacques Pepin. It is labor intensive but I think worth it. Thanks, it’s great to learn something new. You might consider adding a link to explain or demonstrate.